Over the last few years I’ve been doing e-book and print-on-demand book covers for Elizabeth Ann Scarborough, a long-time friend of mine who has been one of my favourite authors even longer than that! I love doing her covers, as her books are so rich in visual detail that the ideas almost jump out onto the page all by themselves. So far I’ve done 20 of her covers, and there are more to come. Most of these were done using a combination of watercolour washes to lay down the initial colour, then working out the details and refining the colours with coloured pencils. 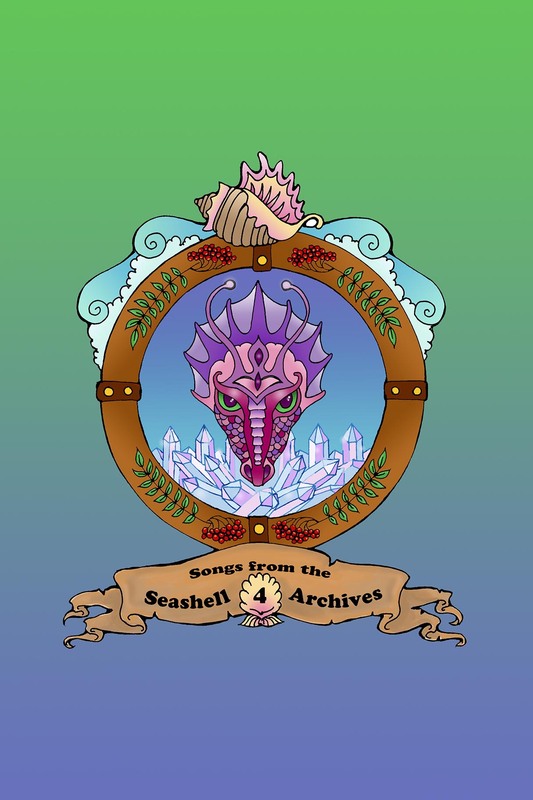 The last five, the Songs from the Seashell Archive series, are a combination of pen-and-ink and digital. I scanned the original drawings and coloured them in Photoshop, then did the lettering in InDesign. All of these are the artwork before the lettering went on — you can see the finished books on the author’s site, find out what they are about, read some samples, and order the books. I used my own instruments for models for these covers. The Phantom Banjo is a magic banjo, infused with the soul of its last owner — and the devil and all his minions are out to kill it! I wanted to include some of the dangers the banjo faced, and still make it look invincible. 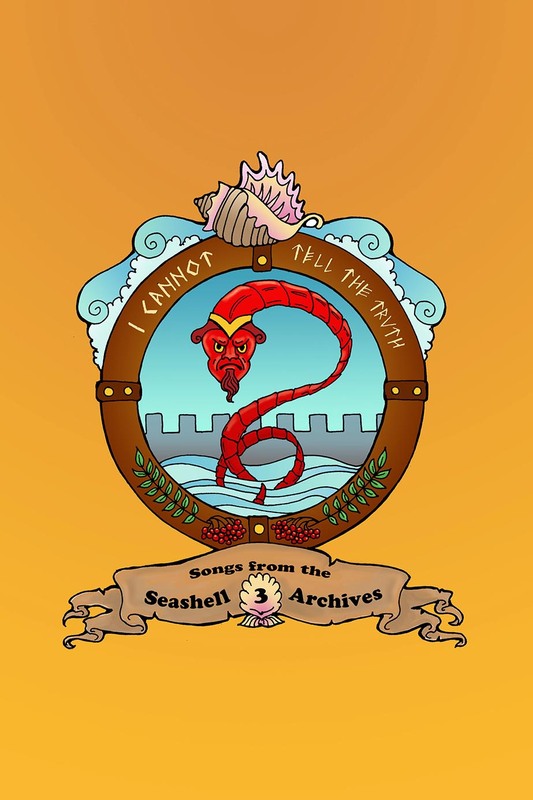 In Picking the Ballad’s Bones, the protagonists (and the banjo, finding its own roots as a harp) go to Ireland to find the roots of their music, so I had to include some Celtic knotty roots. 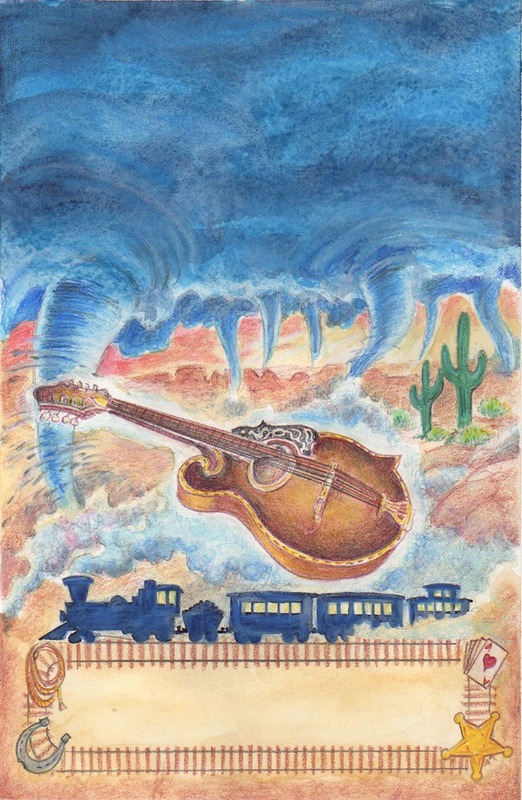 In Strum Again, there were so many elements that I wanted to include, but needed to continue the theme of the instrument as the main image. 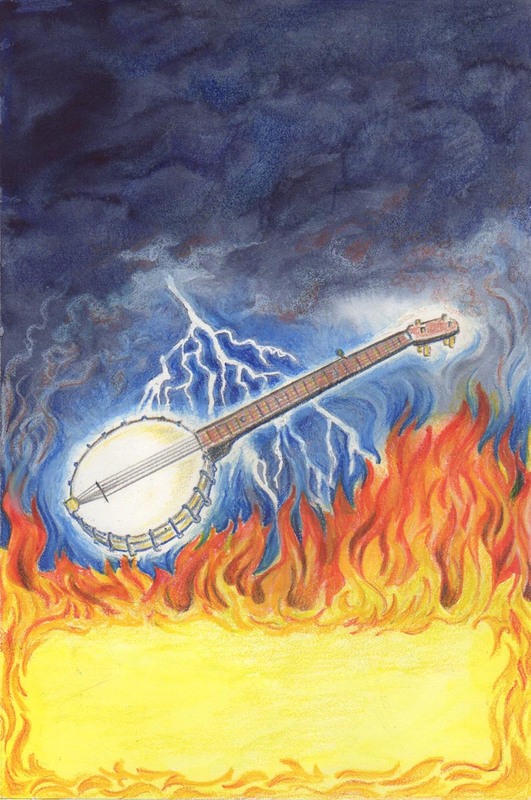 I ended up echoing the theme of the first book, as the devils pull out all stops in trying to destroy the music and the banjo, now reincarnated as a mandolin! Spam faces off with Marcel the vampire in the first of the Spam series, Spam VS the Vampire. 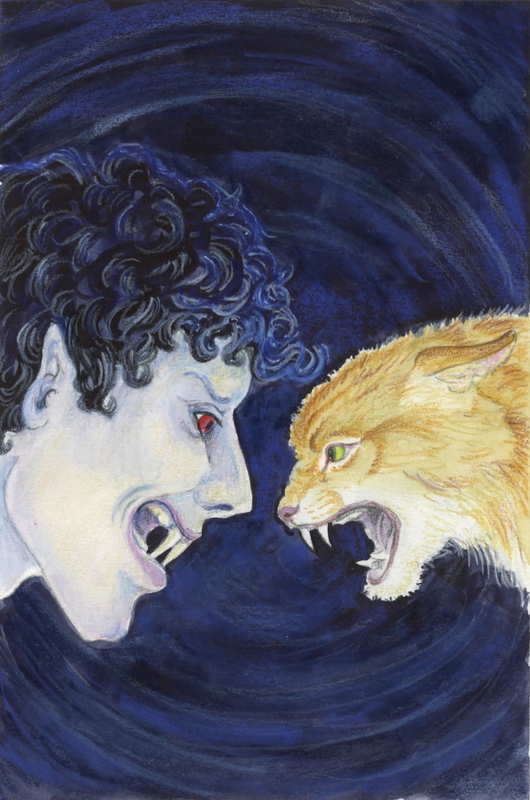 I loved the idea of the tiny, fierce cat looking just as scary as a vampire many times his size! Father Christmas is the second in the Spam series, a shorter story than the others. I illustrated the interior with pen-and-ink drawings of all the characters as Christmas Tree decorations. The cover originally had the ornaments too, but we decided that they were too small and rather distracting looking (though pretty), so I made collage tree branches to cover them up. In The Tour Bus of Doom, the third in the Spam series, Spam’s town is invaded by zombies and he must save it! I wasn’t actually sure what zombies were supposed to look like, so I had to do some research online… eek! I’m glad I only had to draw an arm — I have too vivid an imagination! 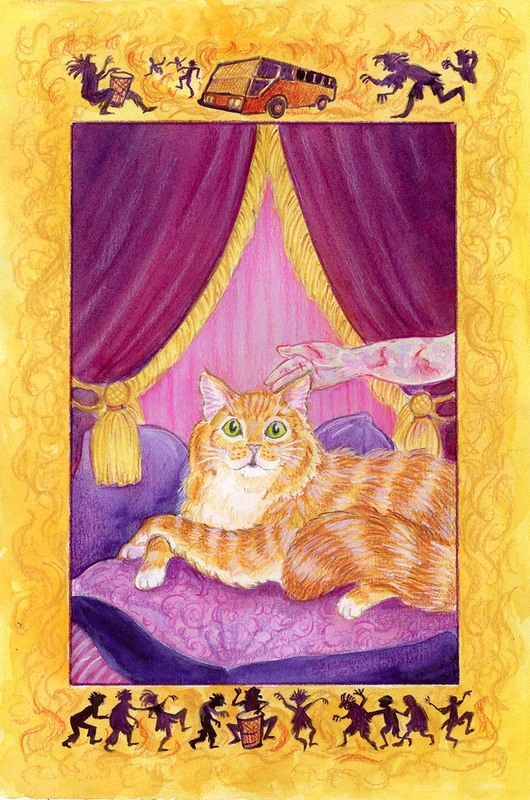 9 Tales O’ Cats is a collection of short stories about — cats! (Bet you guessed that!) 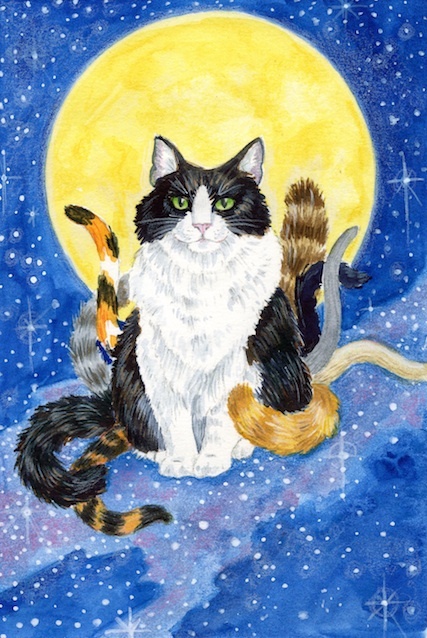 I used my own cat, the ever-photogenic Mak, as a model, and put tails of many colours on him to represent the different cats in the book. I had great fun perching him on the Milky Way. Shifty is another book of short stories about shape shifters. The idea was to do the character from the first story, a teenage girl werewolf, in the act of changing, but it looked really weird to have her half-and -half vertically, and just making her sort of halfway there didn’t capture the mischievous look I wanted. I finally worked out a top and bottom split — try putting your had over the bottom and then the top of her face! 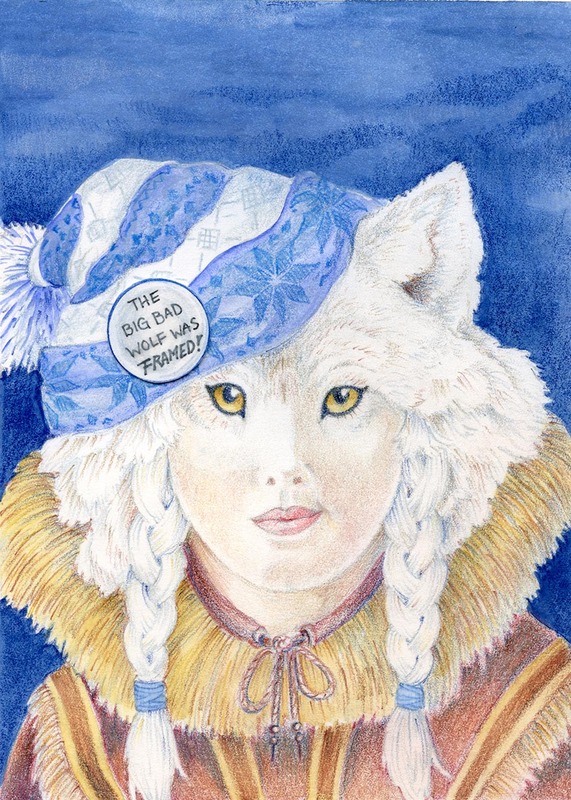 The button on the hat was the author’s idea, which I collaged on after the rest was done. In Channelling Cleopatra, an archaeologist is united with the spirit of Cleopatra 7 through the wonders of modern science. Rather than make an overlay type illusion, I went for a juxtaposition that might have happened as she worked in the ruins. 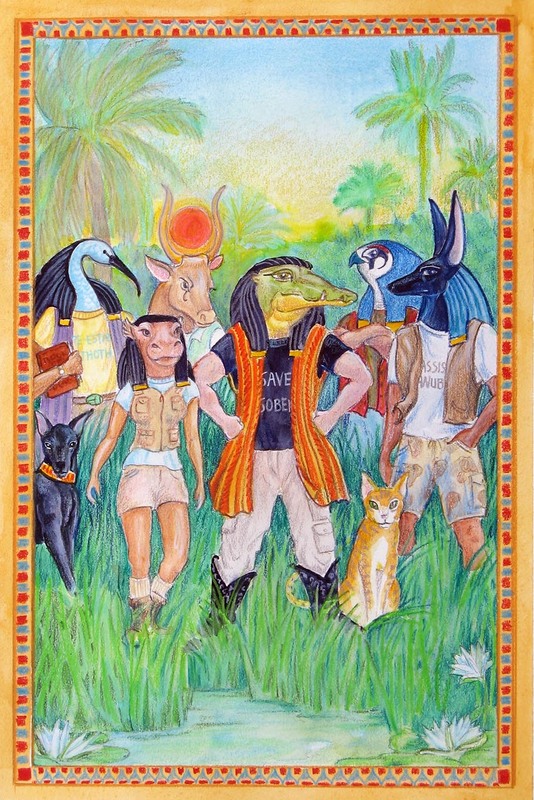 In Cleopatra 7.2, the ancient gods of Egypt are still working for the betterment of the world — this time as a team of environmentalists! 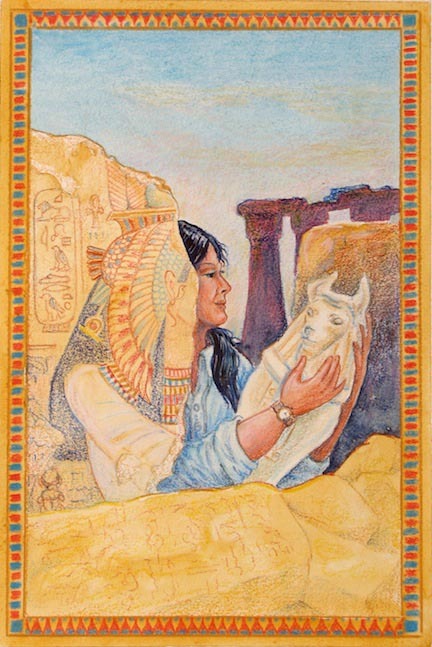 I had great fun researching these characters — when I was a kid I read all the mythologies and every National Geographic story about digs in Egypt. The Godmother is set in Seattle, my old stomping grounds. I really enjoyed imbuing it with a magical feeling. 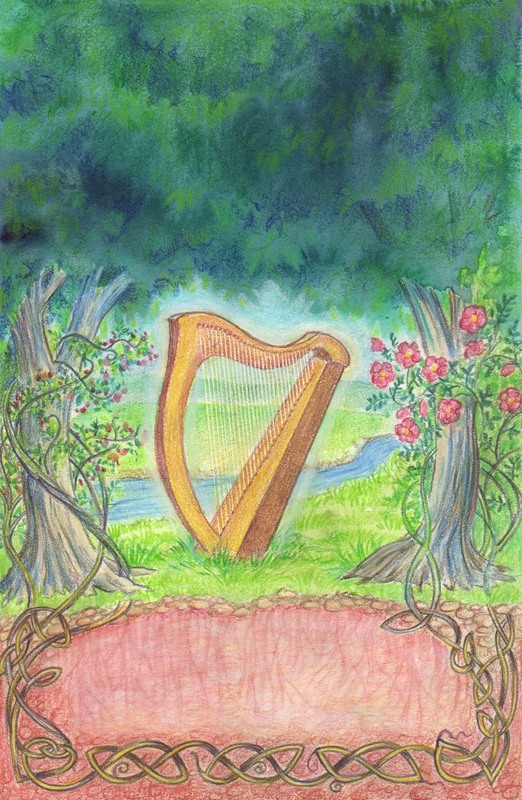 The Godmother’s Apprentice takes place in Ireland, so of course it had to have a Celtic border. I’ve done a lot of Celtic style art over the years, and it was great to put that into practice here! 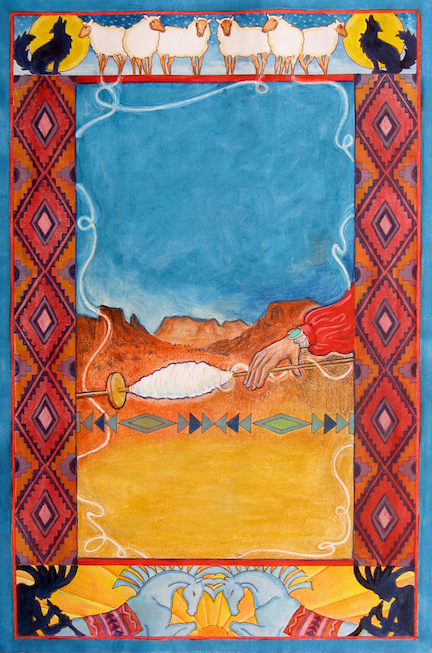 The Godmother’s Web is set in the Southwest, so I did a lot of research on Hopi and Navajo designs, and even watched a fascinating video of a woman showing the traditional way to spin. wool. Then the hard part came — how to create the border from all the wonderful designs I had seen! I ended up making my own, based on several different ones. 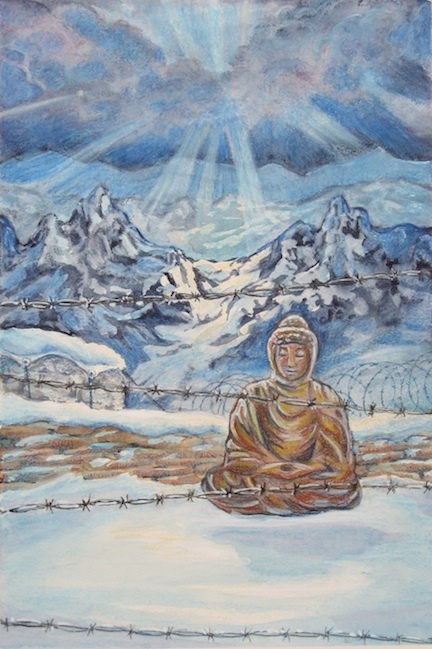 Last Refuge — a sequel to the destruction of the world! 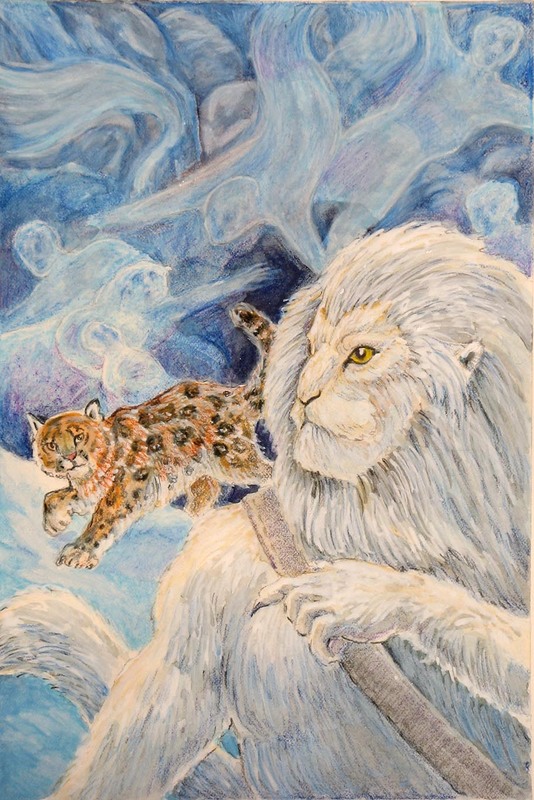 There are lots of ghosts, a yeti, and a snow-leopard who is actually a reincarnated monk. The description of the yeti in the book said that it looked more feline than primate in the face, so that’s what I went with; he’s modelled on a lion, but I tried to make him look a little bit human too. 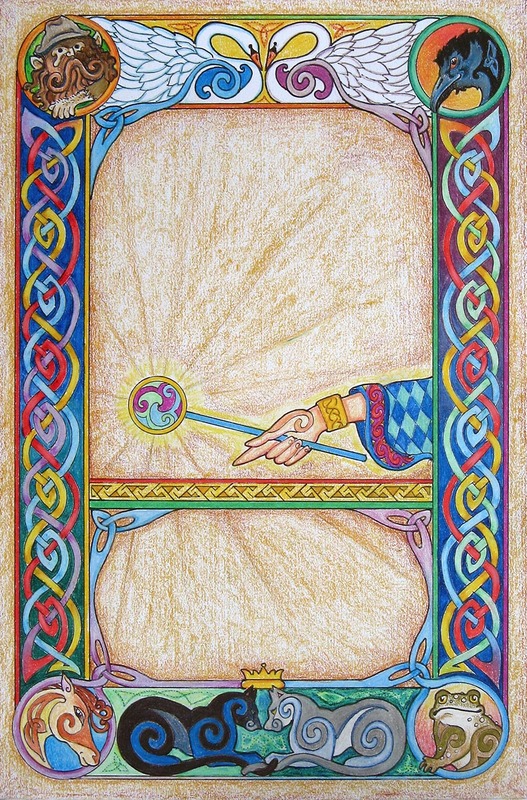 Song of Sorcery — I started with a pen-and-ink drawing, then coloured it in Photoshop and added the lettering in InDesign. I was originally going to paint it, but time was short. I ended up loving the look of the pure, intense colours. 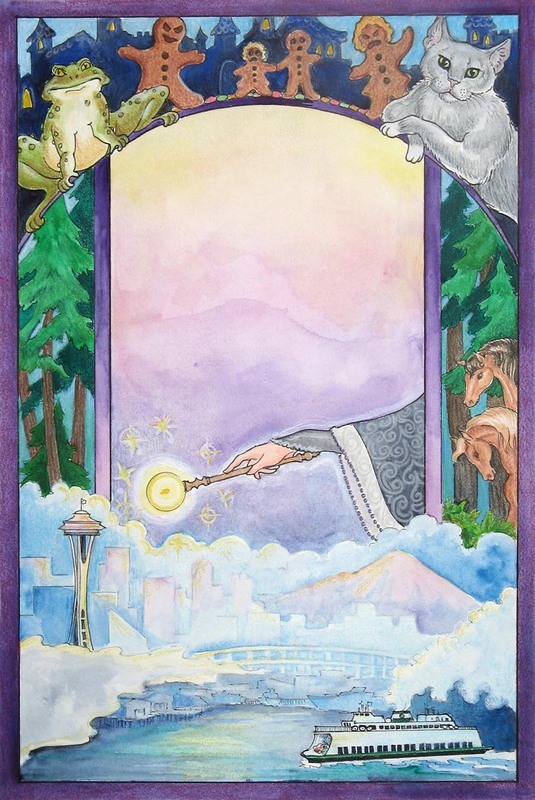 The Unicorn Creed — I used the shield shape from the first cover, and popped in a pen and ink drawing of the interior of the shield. That saved a lot of work! 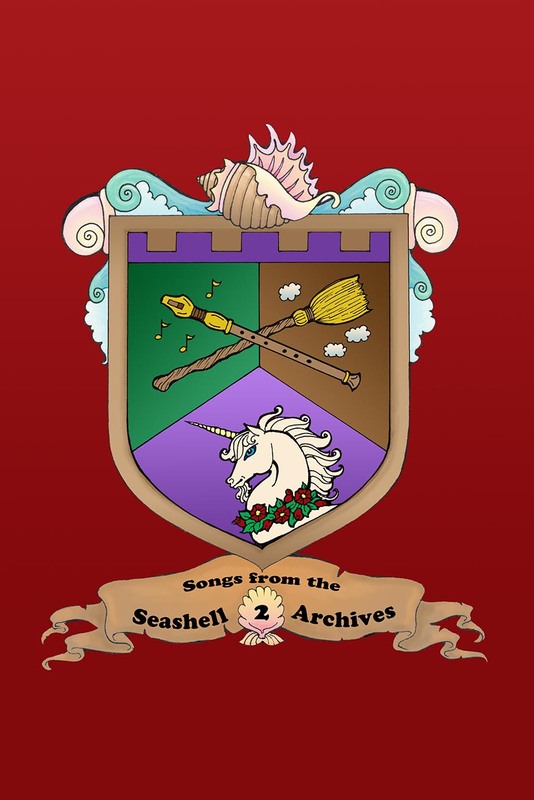 Bronwyn’s Bane — The shield shape has changed here, because the shield belonging to the main character in the story is round. I once again drew the design in pen and ink (I was able to trace the banner design to keep in consistent) and then had fun with the colouring. It was important to keep all the colours of the backgrounds distinctive — don’t you just hate it when you’re reading a series and you pick up one you’ve already read because the covers are so similar? The Christening Quest is probably my favourite of these covers — not only has it got a purple dragon, but I got to do crystals! 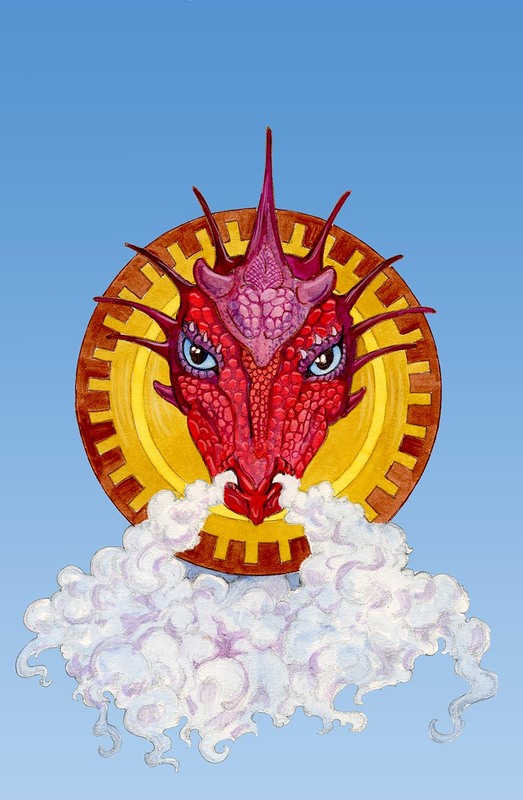 The Dragon, the Witch, and the Railroad is set at a later time from the previous books in the series, in a Victorian-equivilant era. This is the cover art without the banner, which I’ll put in later; it still echoes the shield shapes, but now it’s become a steampunk gear! 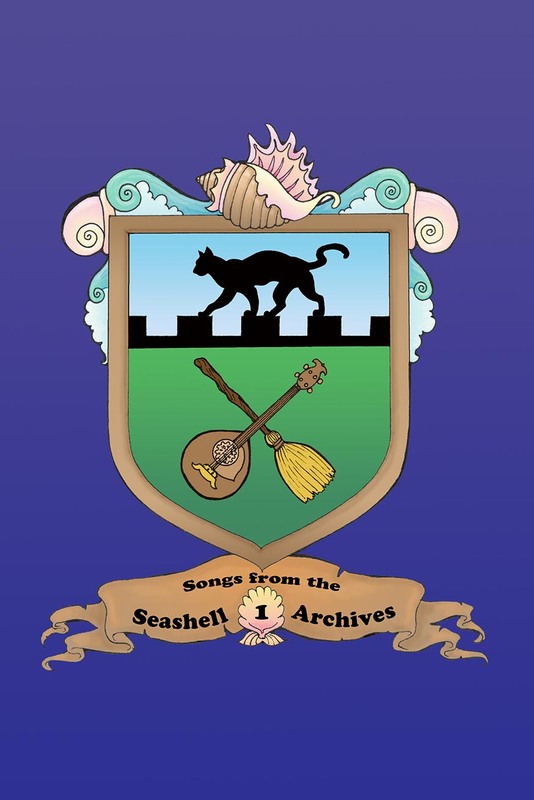 In the latest cover design in the Songs from the Seashell Archives series, Shell Game, the dragon from the previous book cover joins ghost cats, wizards, and beads on the traditional shield shape. It is as yet unpublished, I’ll add a link here when it is! 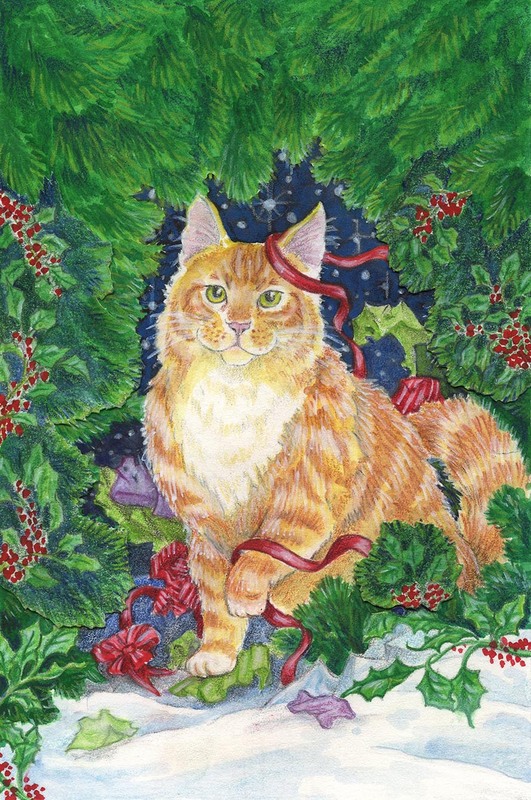 Spam the cat stars in a spooky Christmas tale, Spam, the Spooks, and the UPS Bandit. I did an in-progress blog post here.